Not very deep inside me is a still-space-obsessed Inner Child who thinks space flight is the coolest thing ever. As a kid in the sixties, I was super-excited to follow the Mercury and Gemini and Apollo missions as they happened, and I covered the walls of my bedroom with the space posters NASA would send me by the ton whenever I wrote to ask. Space was real then. Apollo 8 orbited the moon in 1968, and in that same White Album year, 2001: A Space Odyssey convinced me that space ships full of people would be tooling around the solar system before I was even 50 years old. I wanted to go! Of course it didn’t quite pan out that way. The moon landings ended in 1972 and I never got to be a test pilot and an astronaut which was my plan since I was ten. We did have a cool space shuttle for a while, and astronauts on the International Space Station (ISS) still circle the globe every 90 minutes. We’ve also sent a bunch of amazing robots to tool around the solar system on our behalf. This isn’t as exciting as the 2001 movie, but I like all of that stuff too. Even though my obsession is usually turned down to a low simmer, every once in a while something will trigger my Inner Space Child and I will get super-excited again. Sometimes it’s a book, often by Kim Stanley Robinson. Sometimes it’s a movie like The Martian in 2015. But most often it’s something Elon Musk says or does. NASA is still doing lots of important work but it seems that SpaceX gets all the glory. That’s probably because of Elon Musk’s hyperactive Inner Child, and because Elon (yes, I call him Elon) has huge ambition, a huge fortune, and a huge ego, so he can say, “wouldn’t be cool if we could build a rocket that’s bigger than a football field that could fly dozens of people to Mars” and the SpaceX engineers will all say “I’m on it.” And they are. That’s the already-in-work “BFR” which stands for “Big Falcon Rocket” (sure it does). I’ve also seen it called BFS for Big Falcon Ship, and if it really happens as planned, it will certainly be the first true space SHIP, huge and fully re-usable. Elon says that “short test flights” will begin in 2019. That probably means 2020 or 2021, but still. They are seriously building a space ship to colonize Mars (it will do lots of other stuff too). This week I got excited when I learned about a new SpaceX add-on for the Orbiter 2016 space flight simulator. Orbiter is a free space-flight simulator that runs on a PC. It has accurate physics and beautiful graphics and it is a Space Nerd Inner Child’s dream come true. I spent about a year obsessed with it when I first discovered it in 2005. I even wrote a book about it, Go Play In Space, which teaches you how to do just that. I still fire up Orbiter on my PC every now and then, usually when I hear about some new features or some cool new add-on developed by someone in the Orbiter community. 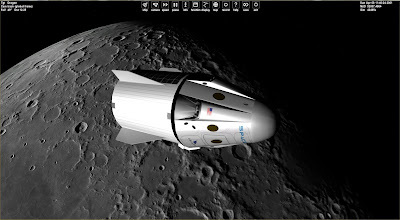 The new add-on is a model of the SpaceX Crew Dragon spacecraft that is set to start carrying astronauts for NASA in 2019 (an “add-on” is a user-developed set of 3D models and computer code that work within Orbiter to simulate a specific spacecraft). This one was the latest work of “BrianJ,” a talented add-on creator who has also made an add-on of the SpaceX Falcon 9 rocket needed to carry the Crew Dragon or other payloads into virtual orbit. In late 2017 another prolific add-on maker (“francisdrake”) created a model of the SpaceX BFR. 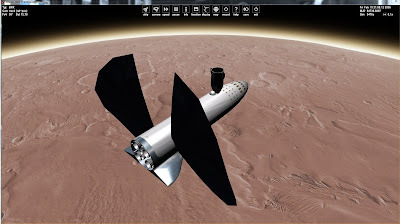 To capture the picture above, I created a scenario in Orbiter 2016 with the Crew Dragon docked to the “top” of the BFR in low Mars orbit (BFR's "wings" are actually solar panel arrays that deploy like Japanese fans). For scale, the SpaceX Crew Dragon with its “trunk” is about 27 feet or 8 meters long, taller than a two-story house. So you can see that the BFR is indeed a Big something Rocket. Search for "BFR size comparison" and you will find many illustrations of its incredible size. Also check out this speculative but suggestive cutaway diagram of the interior of the BFR's second stage (the part that will go to Mars). But Orbiter add-ons are more than just pictures or even 3D models. They are working models of the spacecraft, so they can be launched, flown to orbit (or to Mars), maneuvered, entered in the atmosphere, and landed. The Falcon 9 first stage and the BFR are “tail sitters” so they land with rockets blazing. I haven’t tried this yet with the BFR, but I have flown BrianJ’s Falcon 9 and Falcon Heavy a few times (the built-in autopilot makes this rather easy). If you’d like to see it without bothering to install Orbiter, you can watch a video like this one. It's really amazing to see the first stage boosters turn around and fly themselves back to their landing pads. Is it weird to be so obsessed, still space-crazy after all these years? Maybe. But I prefer to think that I’m nurturing a sense of wonder that never quite left me. Or something like that. This picture shows BrianJ's SpaceX Crew Dragon orbiting the moon in Orbiter 2016.